Last week marked one month since we made the big move into our new home. It's kinda hard for us to believe. Time flies when you're having fun! To mark the occasion, I put together a little list of all the projects we've started or accomplished in the last few weeks and all the things we plan to tackle in the upcoming months. This is the easiest way I could think of to share with youall the ideas and plans we're discussing between the two of us. I hope to blog about a lot of the projects in the future, but in case I don't get a chance, you'll know what's up. Here's what we've started--not to be confused with "finished." Not everything on this list is done yet. Figure out furniture placement throughout the house. Paint the living room/entry walls and ceiling. 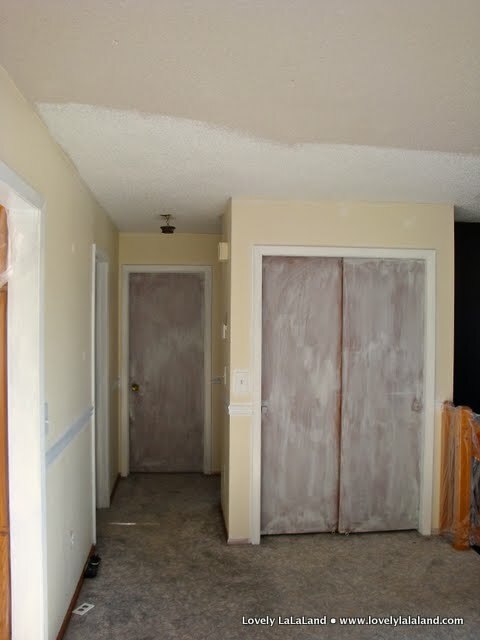 Prime and paint all the trim and doors on the upper level. Remove the blinds throughout the house (they're not very allergy-friendly) and replace with simple shades. Replace all exterior door hardware and locks. Order flooring for the main floor. More on that here. Tear out the carpet and install engineered hardwood flooring upstairs. Find a nice, big sectional for the living room. Remember when I discussed sectionals here last spring? We're glad we never pulled the trigger on that purchase. Our needs and preferences have changed some. What we thought was our top pick--IKEA's Karlstad sectional--is no longer in the running. I'll share more on this later. Mount the television to the wall. Rather than buy an expensive mounting kit, I'd love to use one of the DIY methods. Maybe do something like this or this. Install recessed lighting in the living room. Replace ceiling fan above dining table. I'd love to DIY a fixture like this! As mentioned here, replace the entry ceiling fan with capice lamp-turned fixture. Replace basement carpets with laminate flooring. There you have it, our game plan. These aren't all the plans we have for the house--just the ones we're hoping to tackle before summer rolls around and we shirft our focus to the yard. And we--of course--already have some outdoor plans swirling around our heads. Should be fun! Oh my, all that you have started it amazing. You will have a completely different house they way you are going. So cool.